Anybody buy Amana Tools tooling from Tools Today? I do, and a little while ago they sent me some free ones in exchange for cutting one of their logos out of some leftover HDPE. Anyway, got a treat in my email inbox this morning, the sign I sent them was used as part of their advertising campaign for those bits. Seen by probably 10's of people! I'm almost famous, haha. I purchased one of their 1/16” Tapered Ballnose bits. 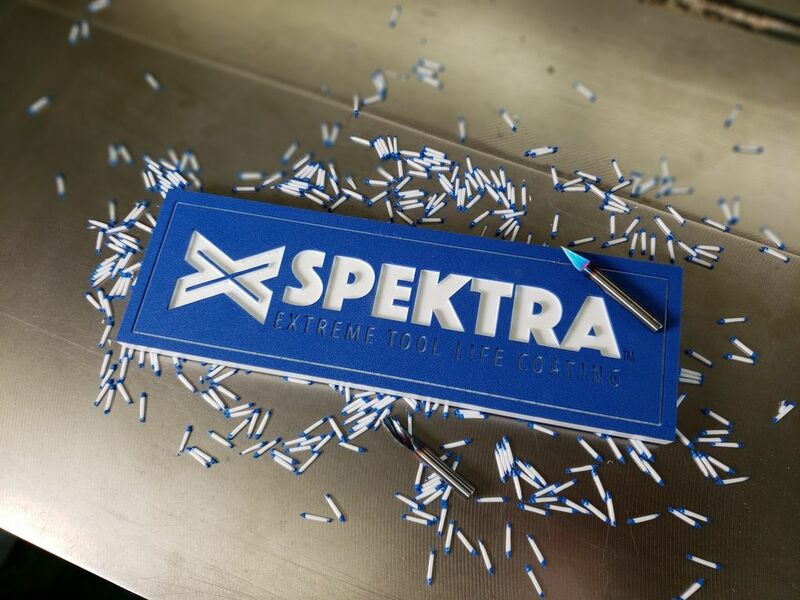 Performs great and waiting to see how long it stays sharp (my main reason for buying the Spektra-coated Bit - for longevity). Nice Job. I used Tools Today exclusively for all of my plastic cutting bits. Haven't tried the Spectra line yet as I haven't needed to. Always nice to see your work in the mainstream. What is the material used in that display. Where do you get it. This particular material is a layered HDPE, called Rowmark Heavyweight. Being in Canada, I purchase mine from Canadian Engraver Supply. This material is nearly identical to a product called King Color Core, which is readily available in the US from various plastics suppliers. Mobius wrote: Anybody buy Amana Tools tooling from Tools Today? I do, and a little while ago they sent me some free ones in exchange for cutting one of their logos out of some leftover HDPE. First of all awesome job, it looks great! Second, they have a pretty large following, ive seen it pop up in spots several times this week. 3rd I love their bits, only time ive had issues were my own fault and they can take a beating.